Epson has recently announced the launch of three new monochrome EcoTank printers. These new EcoTank printers extend Epson’s hugely successful InkTank printer range to over 26 models. The new models M1100, M1120 and M2140 are targeted at the office printing market and come equipped with a host of features that are likely to tempt mono laser printer users to shift to Epson’s EcoTank printers. The new models are specifically designed to lower business printing costs when compared to mono laser printers. With an ultra-low printing cost of 12 paise per print, the new Epson EcoTank M series printers make printing 23 times lower as compared to mono laser printers, which cost Rs. 2.74 per print with original toners. Over the life of the printer, this translates into very significant savings for any organization. Epson says its monochrome EcoTank printers are also designed with an eye on the environment and keeping the UN Sustainable development Goals (SDG’s) in mind. The refill ink bottles provide an ultra-high page yield of up to 6,000 pages per bottle as against laser printers that provide an original toner yield of just 2,000 pages per toner. This can help businesses eliminate the frequent changes of toners and thereby help them significantly reduce their carbon footprint. Another significant cost and environmental saving can be achieved by organizations because the Epson Monochrome EcoTank printers consume just 14w of power as compared to 250w consumed by mono laser printers. This translates into over 17 times lesser power consumption. The new printers have an integrated ink tank that enables spill and error-free ink refilling and allow users to enjoy a laser-quality text that is smudge-proof and water-resistant with pigment black ink. The printers are compact and can be accommodated in a small office space seamlessly. Designed to increase efficiency in the workplace, the new printers come equipped with a host of features like WiFi Direct*, fast print speeds, and duplex printing. Monochrome printers are used in professional environments where there is a requirement for low-cost black prints. Designed to suit a wide variety of small, medium and large enterprises, these printers are also suitable for the retail industry. The new models have a warranty of 3 years or 50,000 prints (including printhead), whichever comes first. 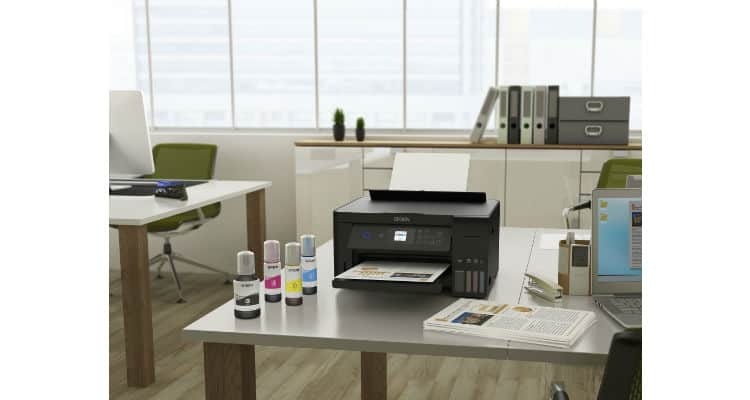 M Series printers to suit office printing need that exists & we believe these printers will transform office printing as we know it” said Siva Kumar, General Manager, InkJet Printers at Epson India. Epson aims to lower office printing costs by 23X 0 out of 5 based on 0 ratings. 0 user reviews.